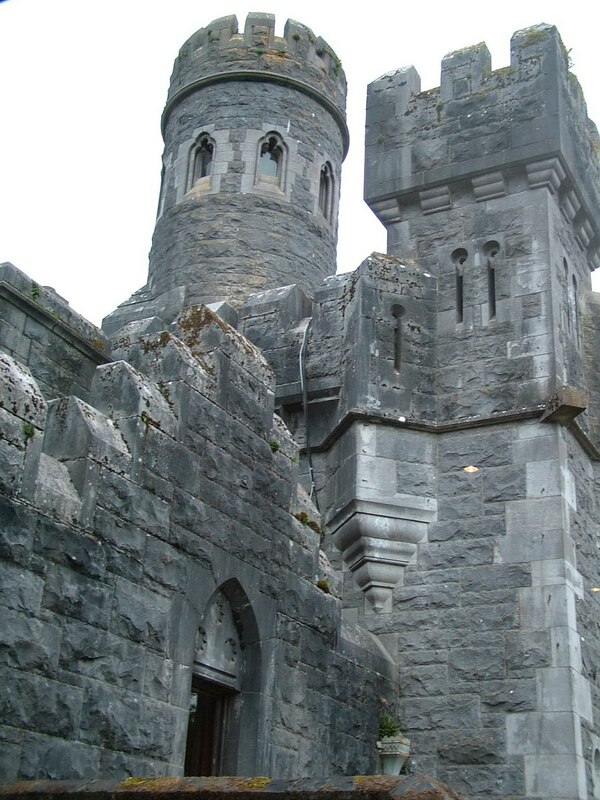 It had been a long day prior to our arrival at Ashford Castle, having left Killarney that morning, explored the Cliffs of Moher, and subsequently hiked about The Burren and discovered the history of Poulnabrone Dolmen. 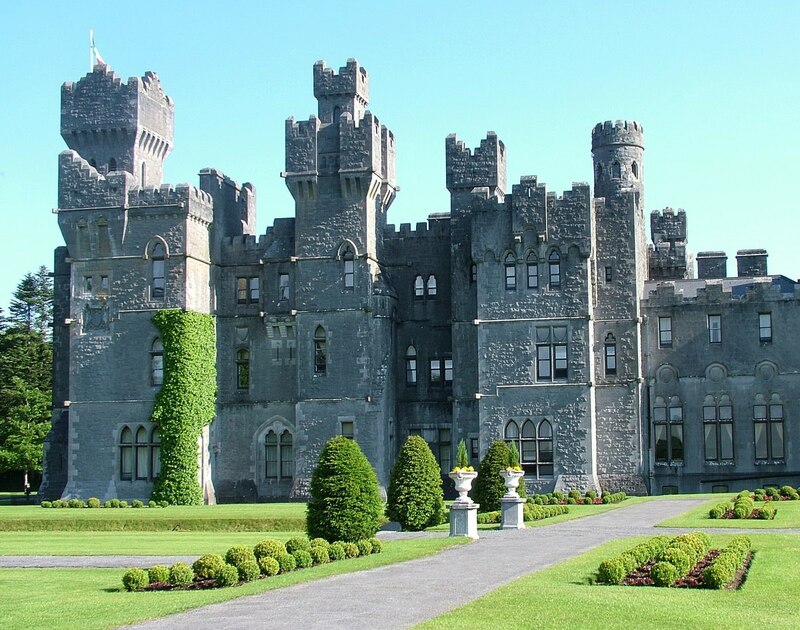 Ashford Castle is located in the picturesque village of Cong on the shores of Lough Corrib in County Mayo, and when we first spotted the magnificent sprawling edifice, we were in disbelief. It would be our “hotel” for the next couple of days, and it was strikingly impressive. When first we arrived, Bob drove the car across the threshold of the estate property by passing through massive gates fortified by towering turrets on either side. We then followed a sinuous, tree-lined lane that was the conduit from the edge of the property to the stately residence hidden deep in over 350 acres of wooded grounds. 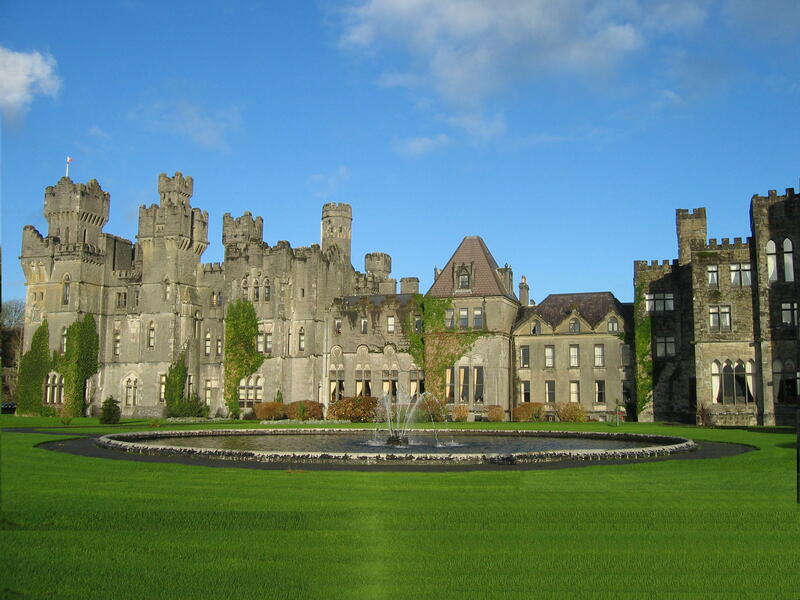 Since first being constructed, Ashford Castle has changed its appearance based on the whims of each subsequent owner going from a defensive castle to a French Chateaux and finally this Victorian Neo Gothic structure. 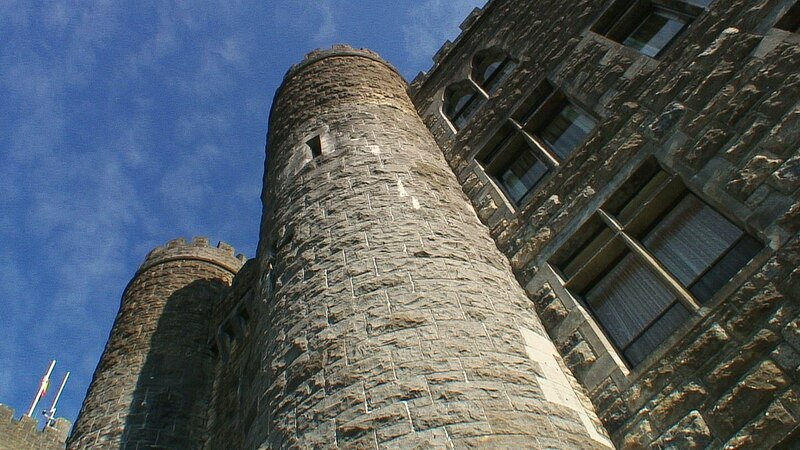 Our first impression of the large castle was that it had been well protected by thick stone walls, multiple vanguards and numerous turrets that all combined into a mock-Gothic baronial edifice. I could hardly wait to see the inside. My gosh! When Bob and I were escorted into the voluptuous foyer, we knew we would be “living” in the lap of luxury. 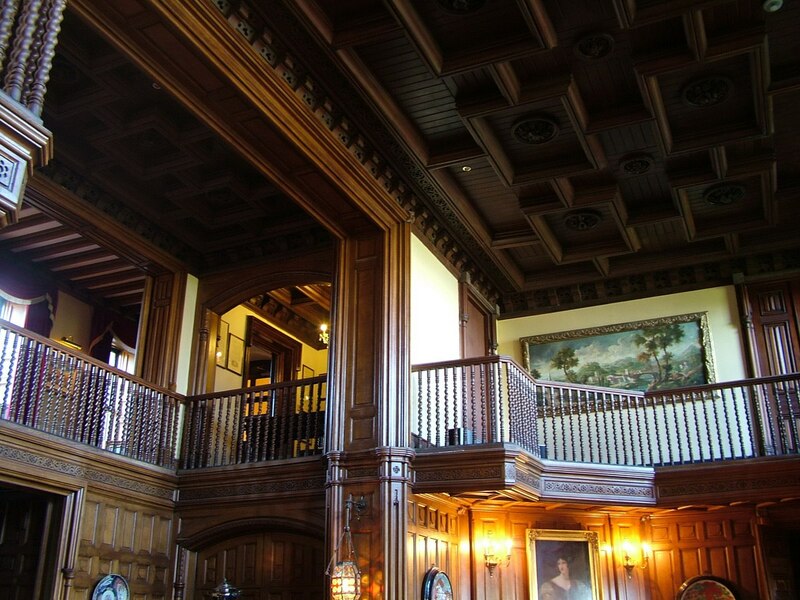 The ambiance was magical, the fine antique furnishings elegant, and the richness of the oak paneling embraced us in a warm welcome despite the capacious dimensions of the space. It all spoke to centuries of care and master craftsmanship. 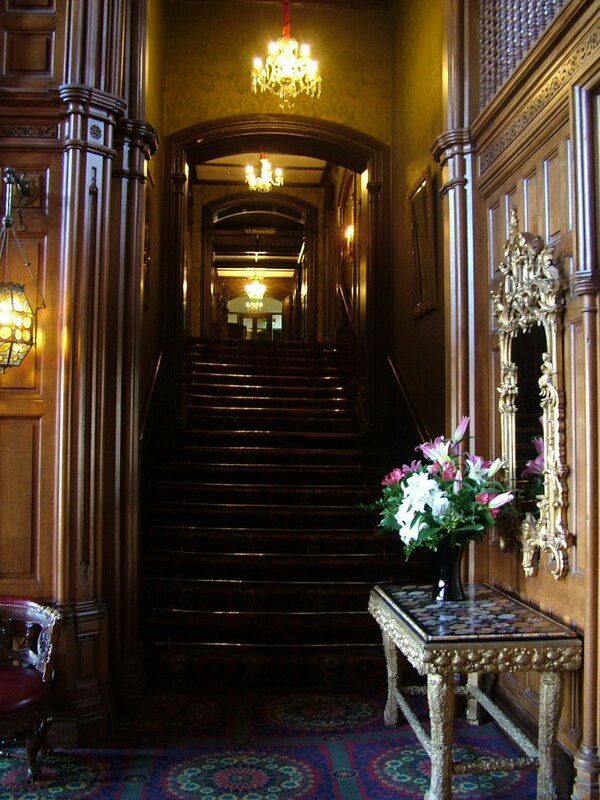 As we were guided through the labyrinth of long hallways and steep staircases in search of our room, we were agog at the luxury of the furnishings and grandeur of the decor, and tantalized by the suits of armour and enormous fireplaces. Around every corner, inviting nooks and crannies enticed us to sit and relax awhile, and being early evening by that time, we were tempted more than once to do so, but our grumbling tummies urged us to make haste settling in and getting ready for dinner. It was marvelous, wandering about the castle, just the two of us, poking about and absorbing the elegance of the surroundings on the way to the dining room. On a couple of occasions, we made a wrong turn and delighted ourselves with a new discovery. 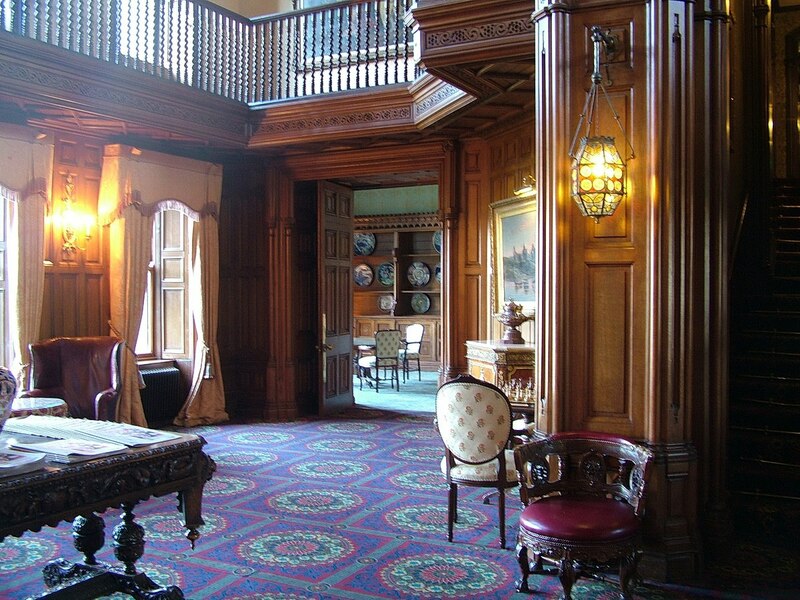 George V Dining Room is the heart and soul of the castle. 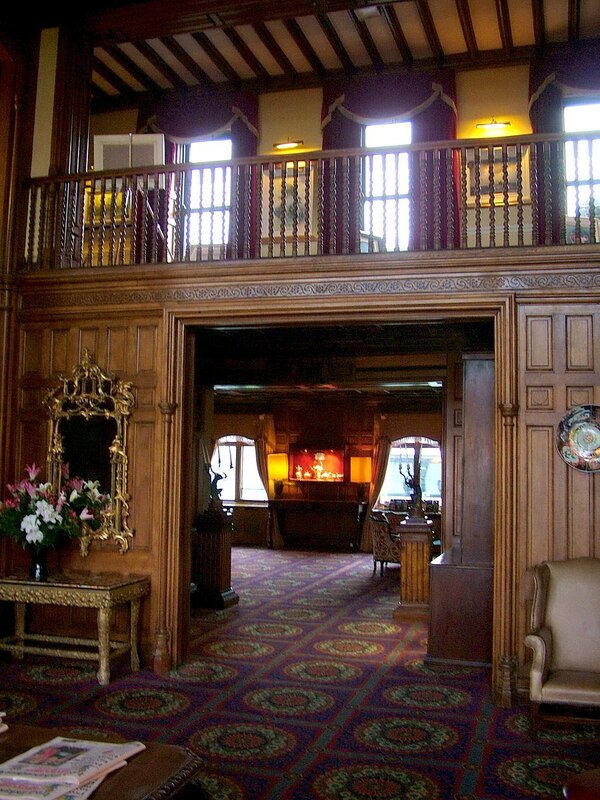 In that banquet hall, built by the Guinness family to host evening dinner parties when Prince of Wales visited in 1906, every guest partakes of breakfast from the sumptuous offerings of an extensive buffet or a separate menu. Taking dinner there is optional, and Bob surprised me with reservations as a special treat to celebrate our lavish accommodations. Everything from the artwork on the walls to the subtlety of fine china, flickering candles and copious windows, all set the stage for the fine cuisine served by the attentive staff. 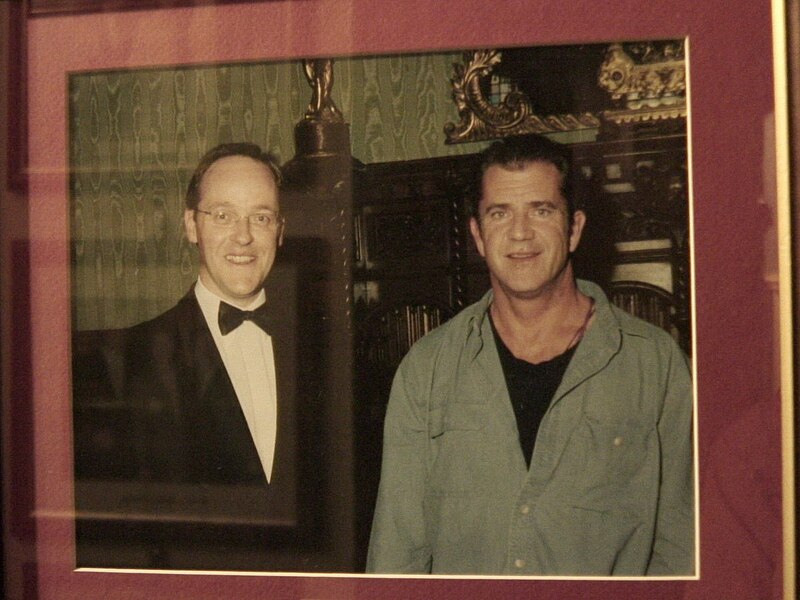 And, yes, gentlemen are required to wear a jacket and tie, but it adds to the glamorous setting. 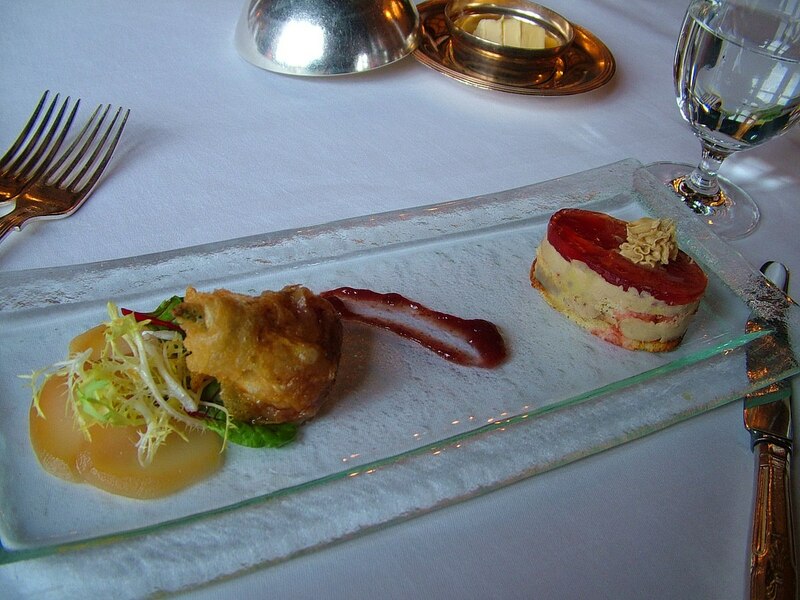 I thoroughly enjoy fine dining and appreciate special little surprises such as an amuse-bouche. The 5-course meal started with our chosen appetizers that consisted of layered duck foie gras accompanied by a delicate poached pear, flavorful roasted fig, and champ (mesclun) with a smear of plum jam. They were divine. 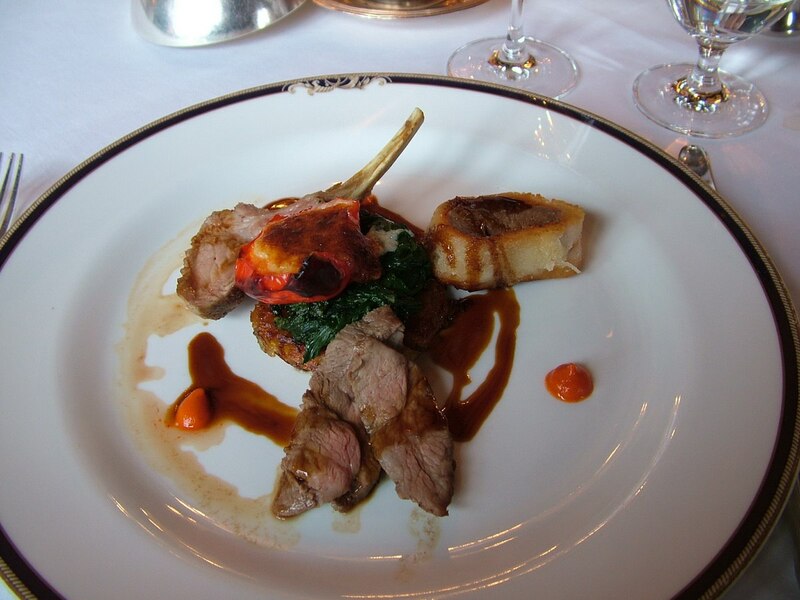 Chef Stefan Matz makes a special effort to source only the finest and freshest local produce, and seen here, is Bob’s entree of fresh Connemara Lamb. Raising of the lamb is a strictly controlled process whereby everything the lambs eat is monitored to ensure a consistent, high-quality meat and flavour. Bob said it was very distinctive and succulent. Because Bob and I grabbed an early seating, we were able to watch the changing landscape of the manicured grounds as the sun dipped below the horizon. 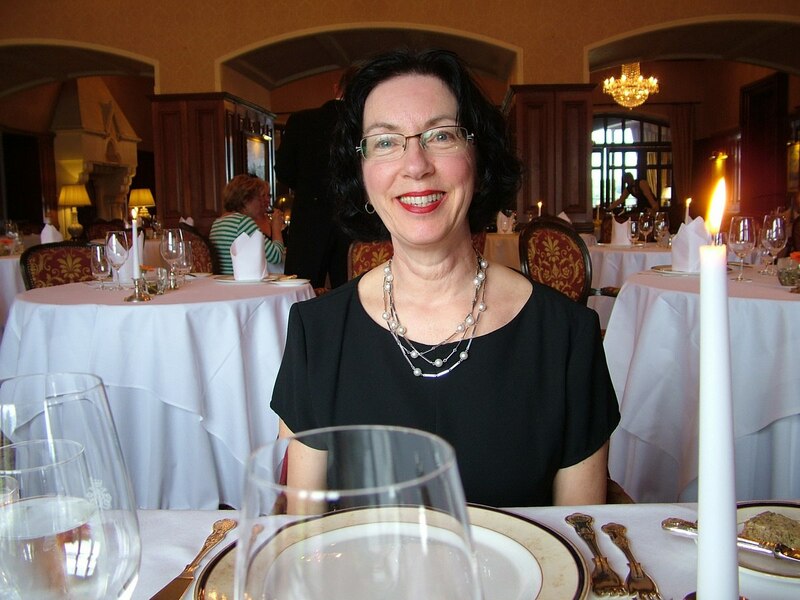 Glittering Waterford Crystal chandeliers bathed diners in a soothing light while we dined like Lords and Ladies. 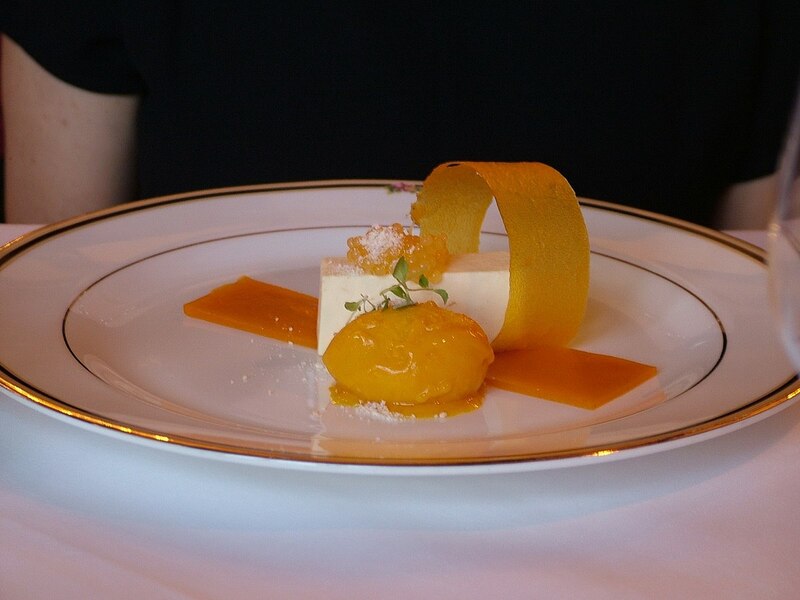 I savoured Coconut Pate with Passion Fruit Caviar, Mango Sorbet and Gelee for dessert all the while lulled by the harmonious notes floating through the air from the grand piano in the Drawing Room. 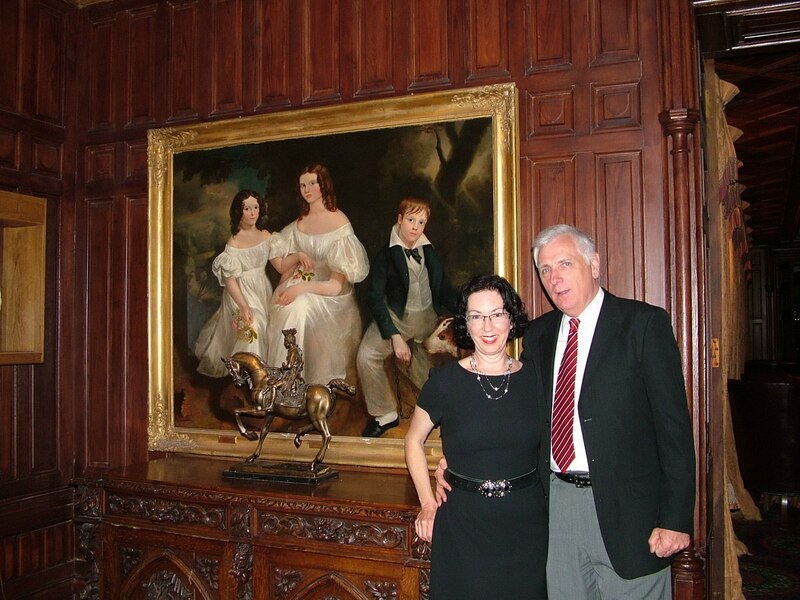 Feeling pleasantly satisfied, Bob and I strolled across the way for a short sojourn in the Drawing Room. 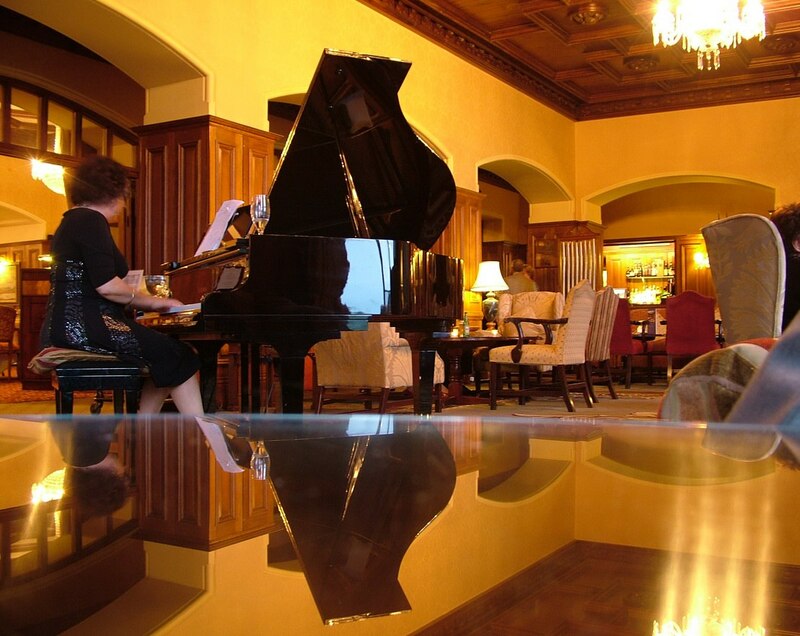 There, ensconced in the cozy luxury of down chesterfields and lulled by soothing melodies played by Annette on the grand piano, Bob and I soaked up the opulence as our day drew to an end. 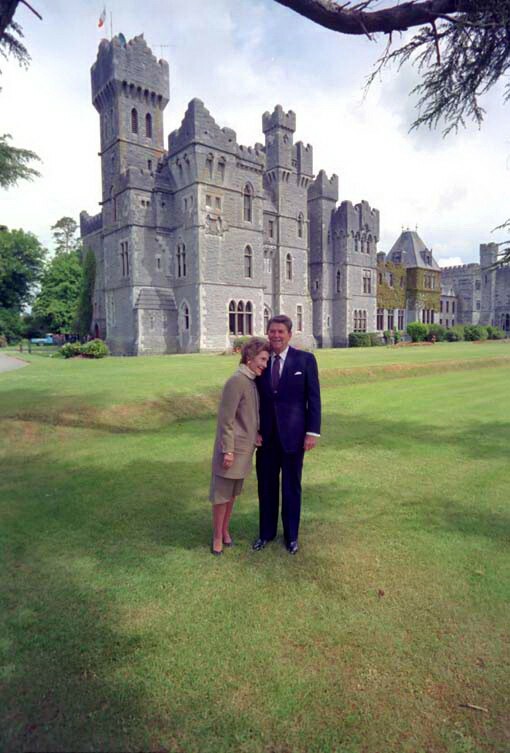 and former President of the United States, Ronald Reagan and his wife, Nancy. We fell into bed shortly thereafter and dreamed of future explorations about the place. The next morning, fluffy white clouds spotted an otherwise blue sky when first I peeked out through the lavish drapes in our bedchamber, so Bob and I were glad for an early start to the day. The generous breakfast buffet is available to guests from 7:30 a.m. onwards, so we were out and about the grounds by 9 a.m. The light was perfect for photographing the baronial showpiece. 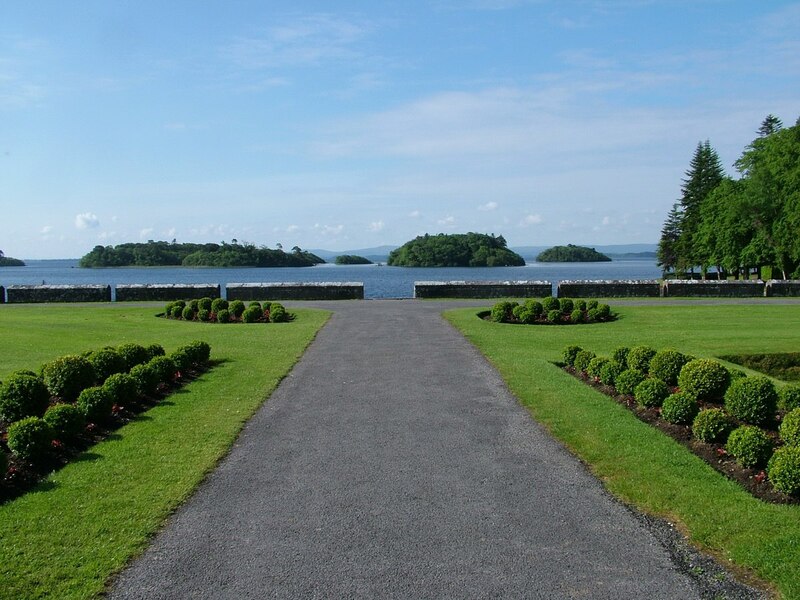 First off, we lingered the length of the primary promenade guiding us to the edge of Lough Corrib, the second largest lake in Ireland. The lake is a haven of tranquility, dotted with uninhabited islands and framed by meadows, reedbeds and woodlots. As we paused by the shore, a Mute Swan glided by with four cygnets in tow. How idyllic was that? 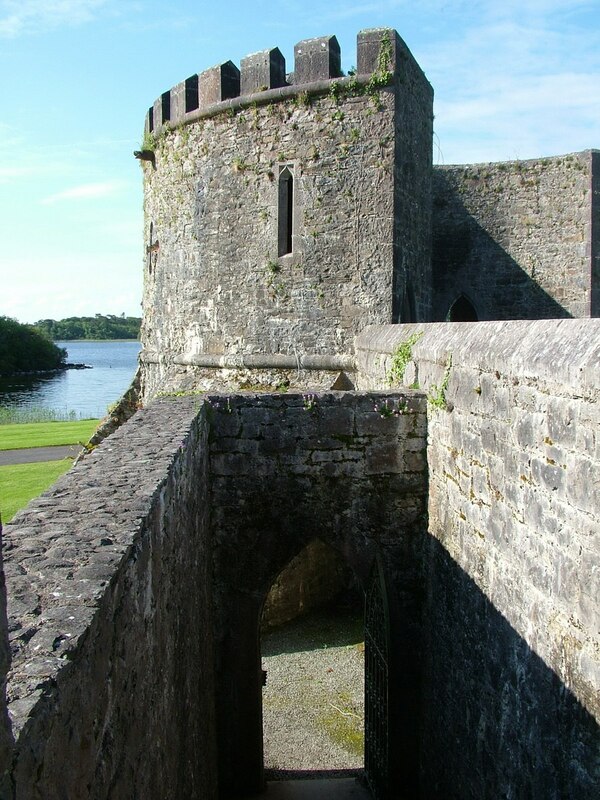 It was lovely standing there within steps of Lough Corrib. 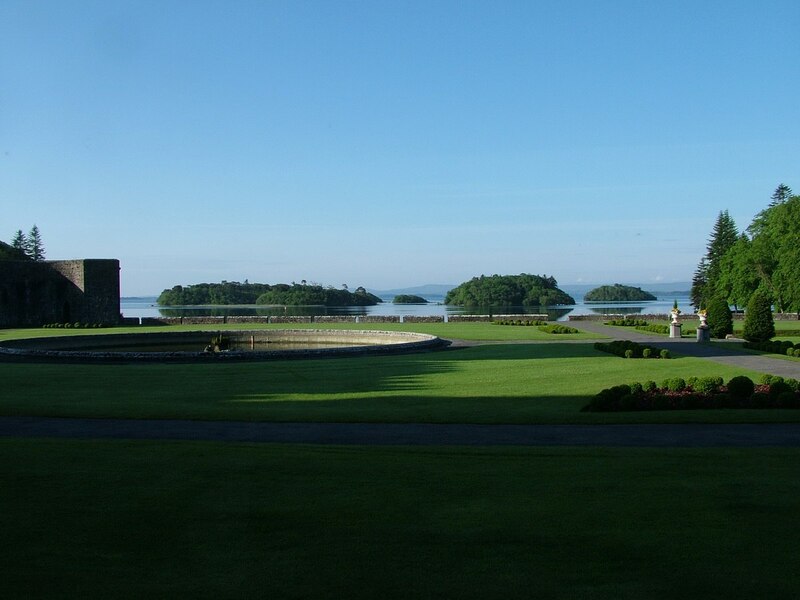 Water gently lapped the pebble-strewn beach at our feet, and looking back, we had a commanding view of the stately castle and sprawling courtyard. Bob and I had free reign as to our whereabouts on the property, which made our explorations all that much more poignant. Poking about exterior ramparts and encouraging ancient doors to open despite their creaking cries of resistance made our skin crawl. How exhilarating it was to walk in the footsteps of the de Burgo family who built the castle on the site in 1228, and it was haunting, at the same time, to know that the castle fell into Sir Richard Bingham’s hands following a fierce battle in 1589. 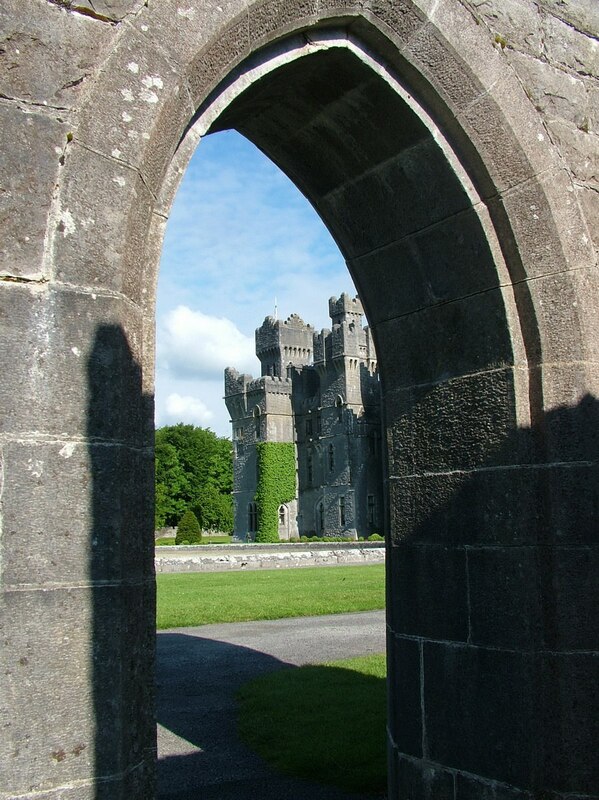 It was Bingham, Lord President of Connaught, that added a fortified enclave within the castle’s precincts. Oh, if those walls could talk, what would they tell us about that fierce struggle? 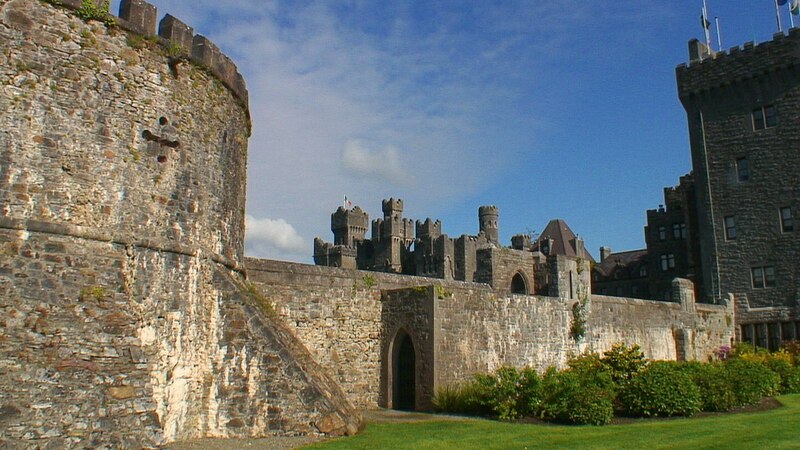 The castle passed through several hands over the centuries with it being purchased in 1852 by Sir Benjamin Lee Guinness of the Irish family who founded the Guinness Brewery. He substantially enlarged the estate to 26,000 acres, commissioned the construction of two large Victorian-styled extensions, established new roads and put in place thousands of trees. As I crept stealthily in the shadow of the defensive walls, I could imagine, in their day, Benjamin’s 3 sons and only daughter playing battle at that same spot whilst spying on the masons, carpenters and gardeners hard at work. 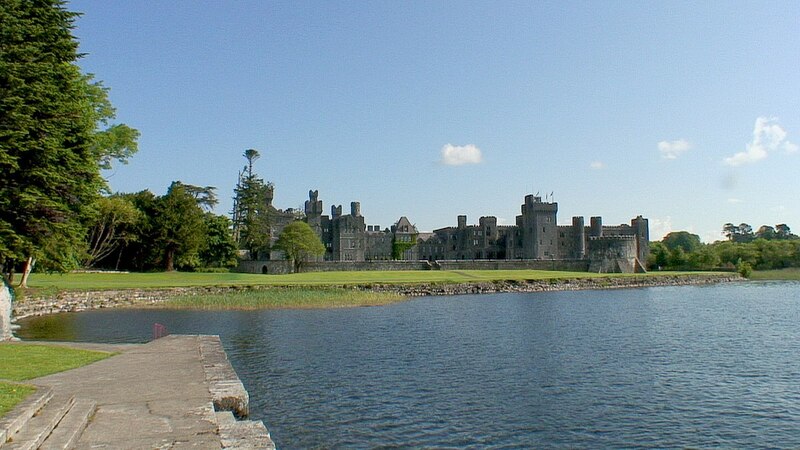 Benjamin’s oldest son, Arthur, inherited Ashford Castle upon his father’s death in 1868, and perhaps inspired by his father’s endeavours, saw to further expansion of the building. The early 18th-century east wing was connected to the two towers of the west wing, towers that dated to the de Burgo occupation of the estate. He also added battlements to the whole castle. 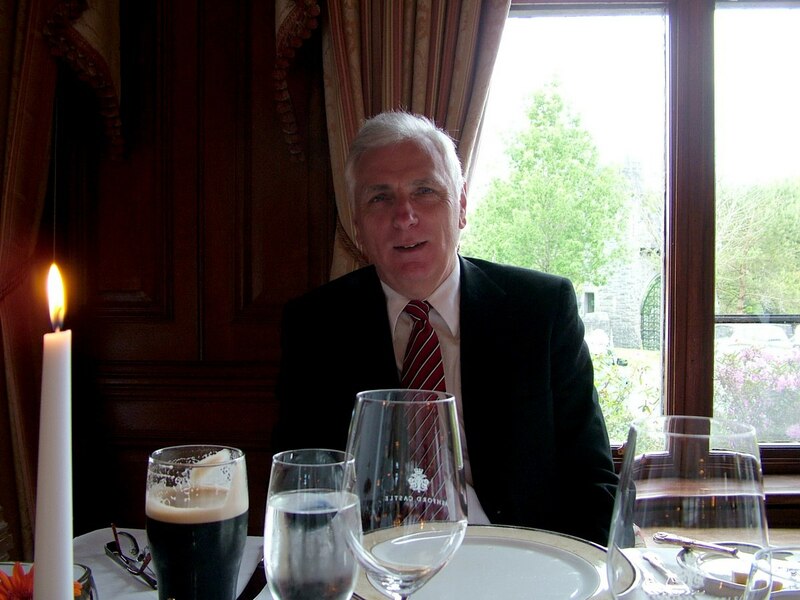 Arthur was an avid gardener who applied his enthusiasm to reforest large expanses of his estate. Expanding on the tree plantings organized by his father, Arthur went on to develop massive woodlands, some of which we would explore later in the morning. 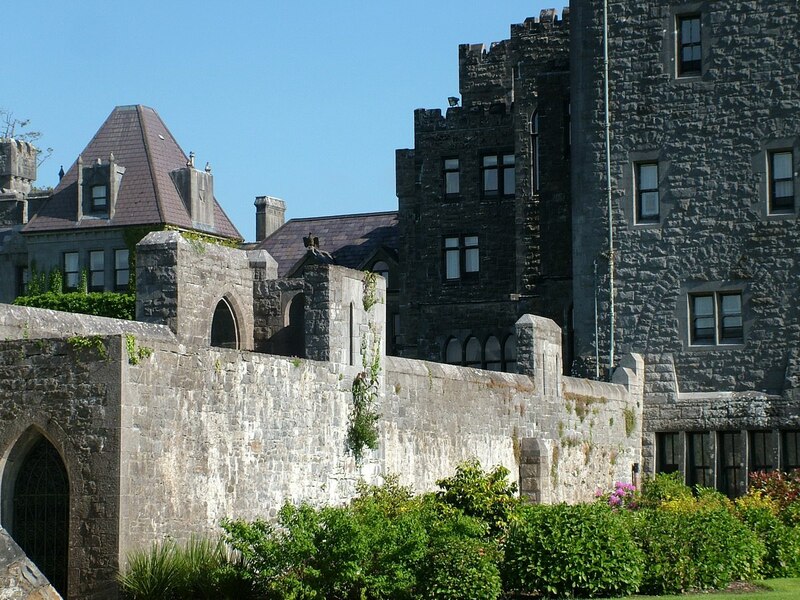 It was Arthur’s and his wife’s deep love of the castle and the estate that led him to come up with the title Lord Ardilaun when he was ennobled in 1880. 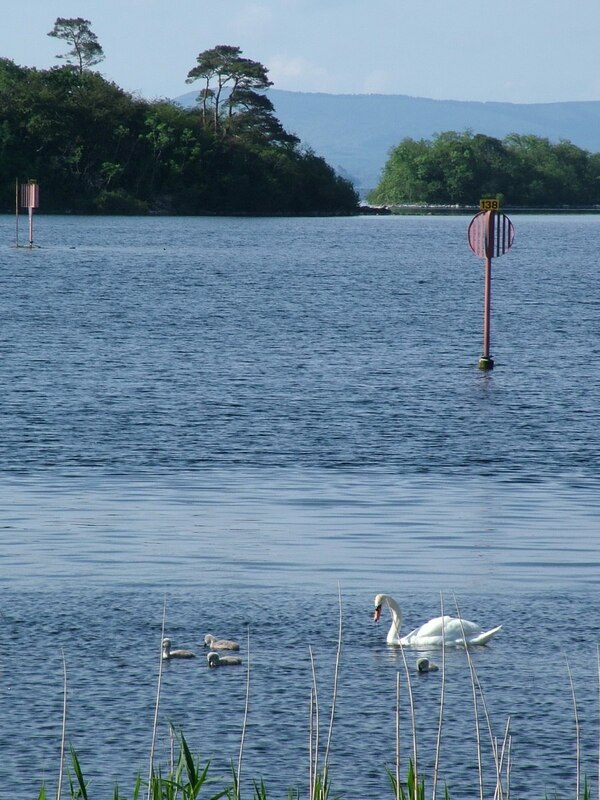 Ardilaun is one of the islands in Lough Corrib, which formed part of the Ashford Estate. It was such a perfect day that Bob and I wanted to remain outdoors. 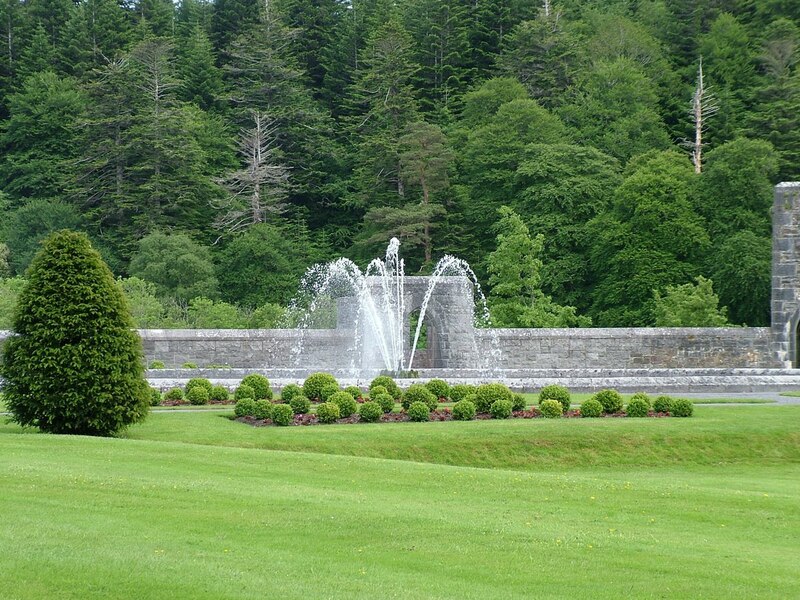 Leaving the immaculately maintained grounds behind, we struck out on a hike. A vast array of trails and roadways crisscross the estate property, so we expected to be gone for quite some time. 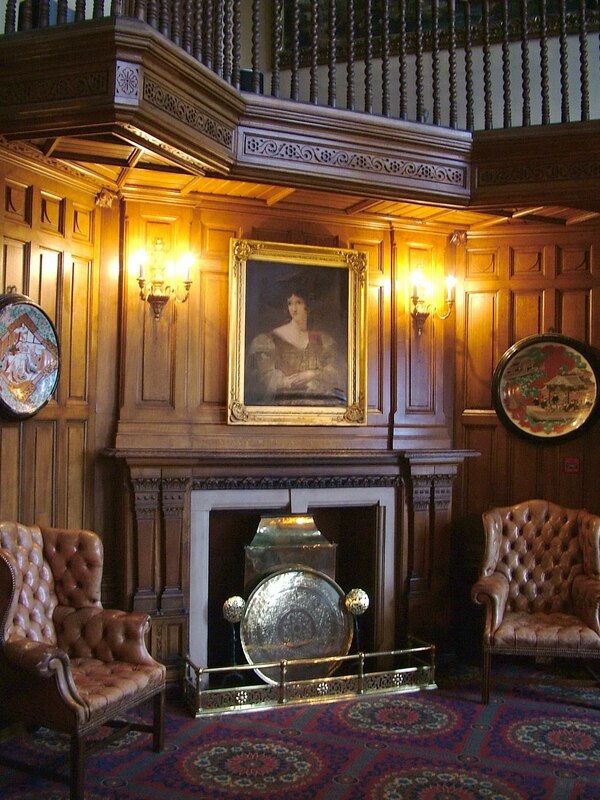 Lunch would be served in the Drawing Room all afternoon, so there was no need to hurry back.